If like Zac Brown you're "Knee Deep" in thoughts of summer where, Your "Only worry in the world is the tide gonna reach my chair." We hear you. We are officially less than 60 days to the longer, warmer days of summer...and we are sooo ready! In honor of that, we thought we would share Elle Magazine's Perfect Memorial Day Weekend list of must haves. After all, most of us do consider Memorial Day the unofficial start of summer; the time to break out the sandals and wear white. White dresses, white jackets, white shorts, white shoes, white pants. Ahhh....yes, the easy days of summer where we get to show off our favorite outfits rather than hide them under layer upon layer of winter jackets and scarves and boots. However, being that we are a little obsessed with handbags, we did notice one "glitch" in the article. It never mentioned handbags! So, we are here to save the day and give you a few of our summer favorites to add to that perfect Memorial Day weekend packing list. Our first Pick for "Perfect Memorial Day Bags" is our Hammitt City Tote. It is both uber fashionable and super functional! Large enough to tuck in that book, your sunglasses and even our Donni Charm Scarf featured below. Plus, the bottom of the bag is a secret hidden compartment. Perfect for stashing an extra pair of walking shoes, snacks, sunscreen or any other necessity to make your Memorial Day weekend the best ever. Nest up, we adore this lightweight vegan leather tote by Lua. The tucked in sides, can be opened up if you need to bring along a few extra essentials for your perfect weekend, and the removable hand-dyed silk zippered insert is perfect for stowing toiletries, makeup or your take-everywhere items that you want easy access to. You can feel good about your choice of either Aubergine or Charcoal because both are vegan leather. 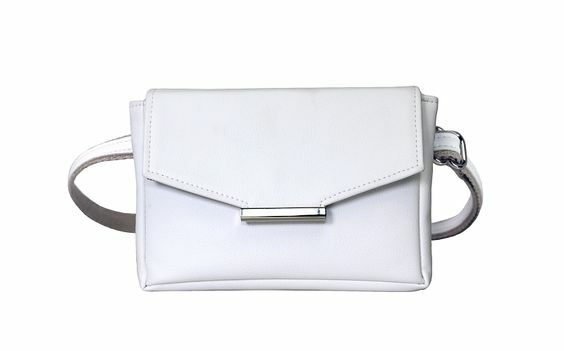 Our newest addition to the lineup at Handbag Tailor is this ultra-sophisticated, eco-friendly HFS white convertible belt bag also in vegan leather. It comes with a matching belt so you can wear it as a bum bag to go hands-free while keeping all your necessities within reach and allowing you to enjoy your long weekend without feeling tied down. Going out? There's a matching silver chain to convert it to a flattering cross-body, or go strapless for a stunningly minimalist clutch. Three ways for you to look fashionable all while be comfortable, organized and good to the earth. May we also offer a few other sun protection/cover up ideas? Note, our suggestions are anything but boring! We think you will find them not only practical...but practically irresistible. A fan favorite is our Donni Charm Web Scarf in 100% cotton. Literally the perfect addition to your summer wardrobe! The web scarf is large enough to wear as a sarong for a swimsuit coverup by day and use as a shoulder wrap by night around a bonfire as the air grows a little cooler, and never mind how it adds a bit of sophistication to a summer sundress or work day blouse when worn 'round your neck. Featured here in white, but available in four perfect wardrobe complimenting colors. Often when we think of sun protection, we forget one of the most important parts...our melon. So, use your noggin and remember to cover up from the top down. Our smart, classic design Wallaroo Hats will keep you covered in style, and with a UPF (Ultraviolet Protection Factor) of up to 50+ are a must for serious sun protection. Another feature we know you will love is the crushable, packable nature of these hats! Tuck one of these in our Hammitt Los Angeles City Tote mentioned above and you're ready for anything Mother Nature throws your way. We hope you have gathered some ideas so you can go out and create your own list of must-haves to kick your summer off right. We are here, and are glad to make suggestions and recommendations based upon your accessory needs whether Memorial Day, Labor Day or any day in between. Leave us a comment, or share your own summer necessities below. We'd love to hear from you!